At the weekend I was in a restaurant where there was a cartoon on the wall. It was showing two gun dogs with one of them protesting, “I'm not putting a dead bird in my mouth. It's against against health and safety!” Whatever you do in life these days it seems you are governed by health and safety rules. 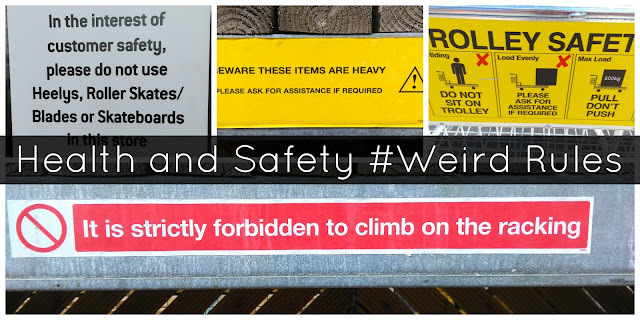 Over the years health and safety rules have been blamed for many things being banned or cancelled but how many of them are actually necessary or indeed law? Once you have children a whole new range of health and safety rules come into play. One of my favourites is the notice on the children's ride-ons you find at supermarket entrances and shopping centres. They always state that the ride is suitable only for ages 3 to 8. Have you ever tried to explain the health and safety implications of this to an 18 month old toddler?! Another weird rule I remember from years ago was when I used to watch Wimbledon play football at Selhurst Park. There was a list of items that were banned from being brought into the ground. Along with the standard glass bottles and sharp objects was rattles and umbrellas. I don't think anybody had used a rattle at a football match for over 20 years! Apparently this ban was put in place as the authorities thought fans would start fighting with rattles and umbrellas! The irony of this was that Wimbledon was famous for having extremely low crowds so you would be hard pressed to find someone to have a fight with! The away end also had no roof on it so when it rained the fans in that section ended up soaked. Our friends over at NEBOSH Training Courses have produced an infographic with their top 5 craziest health and safety rules. How many of these can you relate to?